Hello fans of Abridged Pause! Welcome to the new year and thank you for caring enough to read this! I really love doing this yearly news post, filled with promises of grandiose releases. Unfortunately there are always a few that end up not happening, but it makes it fun to look back on in the future and it also gives you guys a glimpse into what releases are in the works and being talked about at Abridged Pause Recordings. First thing on the schedule is a new various artists compilation entitled “Billowing Tempestus“, coming out in February or March of 2016. 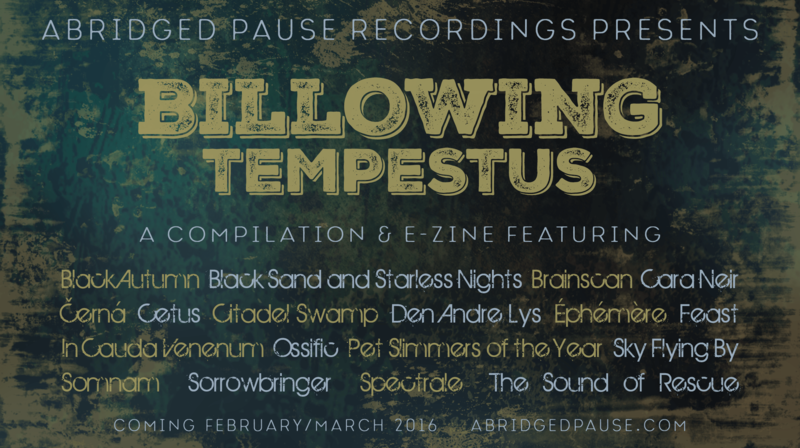 “Billowing Tempestus” is a follow-up to the very first Abridged Pause Recordings release, “Diluvian Temperals“, and will feature bands in the post-black metal, post-metal, sludge, post-rock and ambient genres. The artwork is currently being created by Erich Kriebel of the band Cetus from Philadelphia, Pennsylvania. Every song included on “Billowing Tempestus” will be exclusive to the compilation. These are all brand new, unreleased songs. Most of them were recorded specifically for “Billowing Tempestus“, but a few were pulled out from the archives and hadn’t been heard, even by the bands, in years. Since this is the official announcement of the compilation, I think that the bands scheduled to be on it should be revealed (as if you hadn’t read them already in the flyer above!)! This list is alphabetical: Black Autumn (which was also on “Diluvian Temperals”), Black Sand and Starless Nights (which was also on “Diluvian Temperals”), Brainscan, Cara Neir, Černá, Cetus, Citadel Swamp, Den Andre Lys, Éphémère, Feast, In Cauda Venenum, Ossific, Pet Slimmers of the Year (which was also on “Diluvian Temperals”), Sky Flying By, Somnam (which was also on “Diluvian Temperals”), Sorrowbringer, Spectrale and The Sound of Rescue. This upcoming digital compilation will be accompanied by an e-zine featuring lengthy personalized interviews with each of the bands and liner notes of the release. Think of the e-zine as a digital magazine booklet! This is a very exciting project that I cannot wait to release! But for now all you get is a preview. In Cauda Venenum and Černá have posted teasers on YouTube and Facebook of the songs they contributed. Hopefully this will get you guys excited! 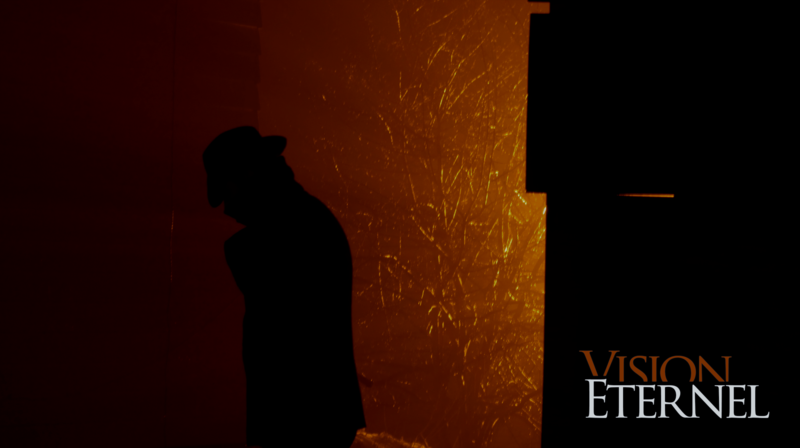 Another fantastic release that’s been in the works since early 2015 (and in talk since early 2010) is the Vision Éternel box set “An Anthology of Past Misfortunes“. If you’re a die-hard Vision Éternel fan, that title may sound familiar. It was originally used in February of 2009 for a Japanese-exclusive compilation regrouping the first two EPs (“Seul dans l’obsession” from 2007 and “Un automne en solitude” from 2008) and came with a poster. At that time, the Japanese compilation regrouped both of the released EPs plus three b-sides, which made it somewhat of a discography. I liked the title so much that I wanted to reuse it for a proper anthology/discography of the band. The “An Anthology of Past Misfortunes” box set will be along the lines of Soufferance’s “Travels” box set, which was released through Abridged Pause Recordings in August of 2013. The box will be hand-designed/colored/decorated and will include no less than seven CDs/7″ vinyls, a DVD and possibly some cassettes to make the hipsters happy. Most of the material in the box set will be appearing on physical format for the first time! The first five CDs/7″ vinyls will be the five Vision Éternel EPs released to date; “Seul dans l’obsession” (2007), “Un automne en solitude” (2008), “Abondance de périls” (2010), “The Last Great Torch Song” (2012) and “Echoes from Forgotten Hearts” (2015). On top of that, no less than two CDs will be filled with demos, b-sides, alternate takes and different mixes and masterings. There is currently four hours of unreleased material to go through. The box set will be extremely limited, as it will be mostly handmade. The box set will also have room for any future Vision Éternel releases, which will all have a limited physical release designed to fit right in. In the far future is also a new Soufferance box set entitled “Tristesse“. Since making the first Soufferance box set, “Travels”, in 2013, which regroup all of the band’s material from January of 2007 to June of 2009, the plan has been to follow it up with another set regrouping everything from August of 2009 to February of 2011. The “Tristesse” phase box set will include the “Bonjour Tristesse” EP, the “Adieu Tristesse” LP and a ton of demos, b-sides and alternate versions and mixes of both releases that were never released publicly. All of the material recorded during the “Tristesse” phase amounts to almost four and a half hours. Citadel Swamp is also working on fresh material with new keyboardist Lucas Martin (also known as Unsilent from the black ambient band Almófar), since he replaced original member Valerio Orlandini in October of 2015. A full length album is finally in the works and will possibly be released through Abridged Pause Recordings in 2016. Other releases that would be amazing to put out through Abridged Pause Recordings are the Black Sand and Starless Nights discography and a Brainscan compilation. The Black Sand sand Starless Nights discography has been in the works since 2009 and won’t come to life until all of the recorded material has been found. As for Brainscan, two EPs were shelved in 2013 and I’d love to have put it out there! I really hope that everyone is as excited as I am about these upcoming projects. First on the list is “Billowing Tempestus“, so keep checking back on abridgedpause.com or facebook.com/abridgedpause for more teasers.